Roddy Meagher’s legacy as barrister, scholar, wit, and aesthete is legendary. When he retired from the NSW Court of Appeal, the Chief Justice, Jim Spigelman, praised him as “the most widely loved judge of his time” and “one of the intellectual giants of our legal history”. Freeman’s biography is the first book-length study of R. P. Meagher QC. It considers his relationship with the Roman Catholic Church, the University of Sydney, the Australian Bar, and the tradition of legal scholarship to which he made a monumental contribution. 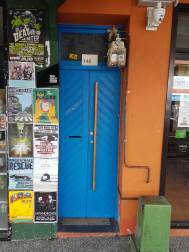 In doing so, Freeman tries to get inside the mind of the man, and offers an analysis of Meagher’s attitude to feminism and political correctness, as well as his place in Sydney’s bohemian and establishment circles. This discussion is set within an account of his marriage to the painter, Penny Meagher, and the central place of art in their life together: for her as artist; for him as art collector. 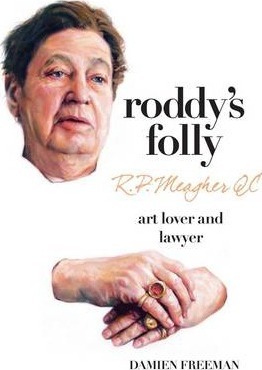 Roddy’s Folly draws on interviews with a range of leading figures in Australia’s legal, political, ecclesiastical, academic, and artistic life, including Sir Laurence Street, Murray Gleeson, Jim Spigelman, Cardinal Pell, Pierre Ryckmans, Dame Leonie Kramer, Marie Bashir, Edmund Capon, Glenn Murcutt, David Handley, Michael Kirby, and John Howard. Michael Kirby’s humorous sketches of the view from the Bench were sketched by him in court and presented to Meagher when the two judges sat together. These previously unpublished sketches are reproduced for the first time in Roddy’s Folly, shedding light on the lighter side of life on the Bench. Damien Freeman studied law, philosophy, and classical Hebrew and Aramaic at the University of Sydney and Magdalene College, Cambridge. In 2011, he published Art’s Emotions: Ethics, Expression and Aesthetic Experience (Acumen Publishing). He has also published in the Australian Bar Review, Public Law Review, Constitutional Law and Policy Review, Harvard Review of Philosophy, Journal of Aesthetic Education, and Literature and Aesthetics. He currently teaches ethics and aesthetics at Pembroke College, Cambridge.